Reliability, consistency, personality. Choosing a professional, especially one you will live with on a mountainside, needs those qualities . . . and more. When you take precious time out of your busy schedule and invest hard-earned dollars into a special adventure, you deserve climbing guides who are experienced, knowledgeable, certified – and also know how to tell a good joke! In the dynamic, ever-changing environment of international climbing and alpine adventures, you also want a company like Go Trek and its irrepressible leader, Craig Van Hoy. He has mountaineering, cultural and environmental awareness, and approaches each climb with contagious enthusiasm. Go Trek’s reputation has brought repeat clientele for both international expeditions and domestic trips – a testament that Craig and his climbing guides are simply the very best in the business. Craig, born and raised in a South Seattle community bordering Puget Sound, began his mountaineering career as a teenager by climbing virtually every peak in the Cascades and Olympic mountains. His first international trip, made at age 20, was the ascent of a peak in the Indian Himalayas. Since then, he has reached the summit of Mt. 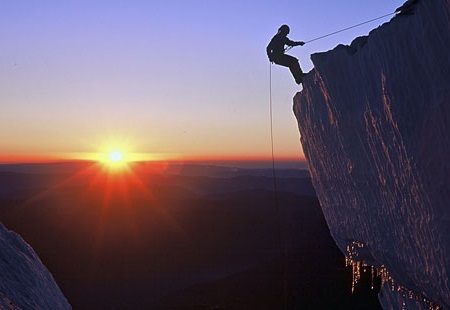 Rainier more than 300 times and has personally lead more than 60 successful treks and climbs in Mexico, South America, Asia, Africa, Europe and Antarctica. Craig has participated on impressive expeditions to climb the world’s highest mountains including Mt. Everest from the north side in 1987 and again in 1991. In 1989, he was a member of the first American team to reach the summit of Kangchenjunga, the world’s third highest mountain. In recent years, Craig’s greatest accomplishment has been watching clients improve their mountaineering skills and climb mountains around the world. In the spring of 2001, two of his clients reached the summit of Mt. Everest, including Erik Weihenmayer, the first blind climber to scale that peak. Combining a love for the outdoors with passion to see people succeed, Craig’s philosophy is for all participants to come away from each trip with a greater appreciation for the mountains and a better understanding of the many cultures we visit. He is one of the select few American mountain guides fluent in both Spanish and Nepali – the primary language of Nepal. Craig lives with his two energetic children, Josiah and Bethany. Craig is a Certified Alpine Guide by the American Mountain Guides Association (AMGA). Mountain Climbing and Trekking Guide Craig Van Hoy will guide you on an unforgettable adventure travel experience!